Twenty one sportspersons of M. M. Modi College, Patiala were felicitated by the Punjabi University for their commendable performances at Senior National and All India Inter-University Sports Competitions. 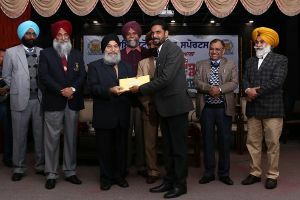 Dr. Jaspal Singh, V. C., Punjabi University, Patiala honoured them with cash prizes of about Rs. 4.5 lac on the occasion of Annual Sports Prize Distribution Function of Punjabi University, Patiala. He also felicitated the college Principal Dr. Khushvinder Kumar with a shawl and cheque of 69,500 as the college bagged Overall Runners Up position in Punjabi University Inter College Competitions during 2013-14. The college also got a prize of Rs. 37,500/- for maximum participation in the inter college sports competitions. College student Priyanka (Cycling) got 65,000/- Lovejot (Archery) got 60,000/-, Sukhbir Singh (Archery) and Pooja Chaudhary (Judo) got 37,000/- each while Jaspreet Singh and Neelam Rani (Archery) received Rs. 30,000/- each as prize money. Other sportspersons got their prizes of Rs. 21,000/- , 15,000/-, 12,000/- and 9,000/- each for their commendable performances at the Senior National and All India Inter-University Competitions. College Principal Dr. Khushvinder Kumar, Dr. Gurdeep Singh, Chairman, College Sports Committee, Sh. Nishan Singh, Sports Officer and Ms. Mandeep Kaur congratulated the prize winning students.